"A's" redirects here. For other uses, see As and A (disambiguation). The Oakland Athletics, often referred to as the A's, are an American professional baseball team based in Oakland, California. They compete in Major League Baseball (MLB) as a member club of the American League (AL) West division. The team plays its home games at the Oakland–Alameda County Coliseum. They have won nine World Series championships, tied for the third-most of all current MLB teams. The 2018 season was the club's 50th while based in Oakland. One of the American League's eight charter franchises, the team was founded in Philadelphia in 1901 as the Philadelphia Athletics. They won three World Series championships from 1910 to 1913 and back-to-back titles in 1929 and 1930. The team's owner and manager for its first 50 years was Connie Mack and Hall of Fame players included Chief Bender, Frank "Home Run" Baker, Jimmie Foxx, and Lefty Grove. The team left Philadelphia for Kansas City in 1955 and became the Kansas City Athletics before moving to Oakland in 1968. They won three consecutive World Championships between 1972 and 1974, led by players including Vida Blue, Catfish Hunter, Reggie Jackson, ace reliever Rollie Fingers, and colorful owner Charlie O. Finley. After being sold by Finley to Walter A. Haas Jr., the team won three consecutive pennants and the 1989 World Series behind the "Bash Brothers", Jose Canseco and Mark McGwire, as well as Hall of Famers Dennis Eckersley, Rickey Henderson and manager Tony La Russa. From 1901 to 2018, the Athletics' overall win–loss record is 8,931–9,387 (.488). The history of the Athletics Major League Baseball franchise spans the period from 1901 to the present day, having begun in Philadelphia before moving to Kansas City in 1955 and then to its current home in Oakland, California, in 1968. The A's made their Bay Area debut on Wednesday, April 17, 1968, with a 4-1 loss to the Baltimore Orioles at the Coliseum, in front of an opening-night crowd of 50,164. The Athletics' name originated in the term "Athletic Club" for local gentlemen's clubs—dates to 1860 when an amateur team, the Athletic (Club) of Philadelphia, was formed. (A famous image from that era, published in Harper's Weekly in 1866, shows the Athletic players dressed in uniforms displaying the familiar blackletter "A" on the front.) The team later turned professional through 1875, becoming a charter member of the National League in 1876, but were expelled from the N.L. after one season. A later version of the Athletics played in the American Association from 1882 to 1891. After New York Giants manager John McGraw told reporters that Philadelphia manufacturer Benjamin Shibe, who owned the controlling interest in the new team, had a "white elephant on his hands", team manager Connie Mack defiantly adopted the white elephant as the team mascot, and presented McGraw with a stuffed toy elephant at the start of the 1905 World Series. McGraw and Mack had known each other for years, and McGraw accepted it graciously. By 1909, the A's were wearing an elephant logo on their sweaters, and in 1918 it turned up on the regular uniform jersey for the first time. In 1963, when the A's were located in Kansas City, then-owner Charlie Finley changed the team mascot from an elephant to a mule, the state animal of Missouri. This is rumored to have been done by Finley in order to appeal to fans from the region who were predominantly Democrats at the time. [citation needed] (The traditional Republican Party symbol is an elephant, while the Democratic Party's symbol is a donkey.) Since 1988, the Athletics' 21st season in Oakland, an illustration of an elephant has adorned the left sleeve of the A's home and road uniforms. Beginning in the mid 1980s, the on-field costumed incarnation of the A's elephant mascot went by the name Harry Elephante. In 1997, he took his current form, Stomper. After buying the team in 1960, owner Charles O. Finley introduced new road uniforms with "Kansas City" printed on them, as well as an interlocking "KC" on the cap. Upon moving to Oakland, the "A" cap emblem was restored, although in 1970 an "apostrophe-s" was added to the cap and uniform emblem to reflect the fact that Finley was in the process of officially changing the team's name to the "A's". 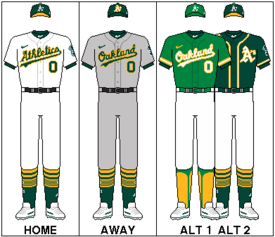 From 1994 until 2013, the A's wore green alternate jerseys with the word "Athletics" in gold. It was used on both road and home games. During the 2000s, the Athletics introduced black as one of their colors. They began wearing a black alternate jersey with "Athletics" written in green. After a brief discontinuance, the A's brought back the black jersey, this time with "Athletics" written in white with gold highlights. Commercially popular but rarely chosen as the alternate by players, in 2011 they were replaced by a new gold alternate jersey with "A's" in green on the left chest. With the exception of several road games during the 2011 season, the Athletics' gold uniforms are used as the designated home alternates. A green version of their gold alternates was introduced for the 2014 season to replace their previous green alternates. The new green alternates feature the piping, "A's" and lettering in white with gold trim. The nickname "A's" has long been used interchangeably with "Athletics", dating to the team's early days when headline writers wanted a way to shorten the name. From 1972 through 1980, the team nickname was officially "Oakland A's", although, during that time, the Commissioner's Trophy, given out annually to the winner of baseball's World Series, still listed the team's name as the "Oakland Athletics" on the gold-plated pennant representing the Oakland franchise. According to Bill Libby's Book, Charlie O and the Angry A's, owner Charlie O. Finley banned the word "Athletics" from the club's name because he felt that name was too closely associated with former Philadelphia Athletics owner Connie Mack, and he wanted the name "Oakland A's" to become just as closely associated with him. The name also vaguely suggested the name of the old minor league Oakland Oaks, which were alternatively called the "Acorns". New owner Walter Haas restored the official name to "Athletics" in 1981, but retained the nickname "A's" for marketing purposes. At first, the word "Athletics" was restored only to the club's logo, underneath the much larger stylized-"A" that had come to represent the team since the early days. By 1987, however, the word returned, in script lettering, to the front of the team's jerseys. Prior to the mid-2010s, the A's had a long-standing tradition of wearing white cleats, which date back to the Finley ownership. In recent years, however, the MLB gradually relaxed its rules on specific sneaker colors, and several A's players began wearing other colored cleats, most notably Jed Lowrie's green cleats. The Oakland Alameda Coliseum—originally known as the Oakland–Alameda County Coliseum, and later named as Network Associates, McAfee and Overstock.com Coliseum—was built as a multi-purpose facility. Louisiana Superdome officials pursued negotiations with Athletics officials during the 1978–79 baseball offseason about moving the Athletics to the Superdome in New Orleans. The Athletics were unable to break their lease at the Coliseum, and remained in Oakland. After the Oakland Raiders football team moved to Los Angeles in 1982, many improvements were made to what was suddenly a baseball-only facility. The 1994 movie Angels in the Outfield was filmed in part at the Coliseum, filling in for Anaheim Stadium. Then, in 1995, a deal was struck whereby the Raiders would move back to Oakland for the 1995 season. The agreement called for the expansion of the Coliseum to 63,026 seats. The bucolic view of the Oakland foothills that baseball spectators enjoyed was replaced with a jarring view of an outfield grandstand contemptuously referred to as "Mount Davis" after Raiders' owner Al Davis. Because construction was not finished by the start of the 1996 season, the Athletics were forced to play their first six-game homestand at 9,300-seat Cashman Field in Las Vegas. Although official capacity was stated to be 43,662 for baseball, seats were sometimes sold in Mount Davis as well, pushing "real" capacity to the area of 60,000. The ready availability of tickets on game day made season tickets a tough sell, while crowds as high as 30,000 often seemed sparse in such a venue. On December 21, 2005, the Athletics announced that seats in the Coliseum's third deck would not be sold for the 2006 season, but would instead be covered with a tarp, and that tickets would no longer be sold in Mount Davis under any circumstances. That effectively reduced capacity to 34,077, making the Coliseum the smallest stadium in Major League Baseball. Beginning in 2008, sections 316–318 were the only open third-deck sections for A's games, which brought the total capacity to 35,067 until 2017 when new team president Dave Kaval took the tarps off of the upper deck, increasing capacity to 47,170. The Athletics are the only remaining MLB team still sharing a stadium with an NFL team on a full-time basis. Since the mid-2000s the A's have been in talks with Oakland and other Northern California cities about building a new baseball-only stadium. The team has said it wants to remain in Oakland. On November 28, 2018, The Athletics announced that the team had chosen to build its new 34,000-seat ballpark at the Howard Terminal site at the Port of Oakland. The team also announced its intent to purchase the Coliseum site and renovate it into a tech and housing hub, preserving Oracle Arena and reducing the Coliseum to a low-rise sports park as San Francisco did with Kezar Stadium. On November 7, 2006, many media sources announced the Athletics would be leaving Oakland as early as 2010 for a new stadium in Fremont, confirmed the next day by the Fremont City Council. The plan was strongly supported by Fremont Mayor Bob Wasserman. The team would have played in what was planned to be called Cisco Field, a 32,000-seat, baseball-only facility. The proposed ballpark would have been part of a larger "ballpark village" which would have included retail and residential development. On February 24, 2009, however, Lew Wolff released an open letter regarding the end of his efforts to relocate the A's to Fremont, citing "real and threatened" delays to the project. The project faced opposition from some in the community who thought the relocation of the A's to Fremont would increase traffic problems in the city and decrease property values near the ballpark site. In 2009, the City of San Jose attempted to open negotiations with the team regarding a move to the city. Although parcels of land south of Diridon Station would be acquired by the city as a stadium site, the San Francisco Giants' claim on Santa Clara County as part of their home territory would have to be settled before any agreement could be made. By 2010, San Jose was "aggressively wooing" A's owner Lew Wolff. Wolff referred to San Jose as the team's "best option", but Major League Baseball Commissioner Bud Selig said he would wait on a report on whether the team could move to the area because of the Giants conflict. In September 2010, 75 Silicon Valley CEOs drafted and signed a letter to Bud Selig urging a timely approval of the move to San Jose. In May 2011, San Jose Mayor Chuck Reed sent a letter to Bud Selig asking the commissioner for a timetable of when he might decide whether the A's can pursue this new ballpark, but Selig did not respond. A 2017 plan would have placed a new 35,000 seat A's stadium near Laney College and the Eastlake neighborhood on the current site of the Peralta Community College District's administration buildings. The plan was announced by team president Dave Kaval in September 2017. However, just three months later, college officials abruptly ended the negotiations. Originally, the term described a series of exhibition games played between the two clubs after the conclusion of spring training, immediately prior to the start of the regular season. It was first used to refer to the 1989 World Series in which the Athletics won their most recent championship and the first time the teams had met since they moved to the San Francisco Bay Area (and the first time they had met since the A's also defeated the Giants in the 1913 World Series). Today, it also refers to games played between the teams during the regular season since the commencement of interleague play in 1997. Through the 2018 regular season, the Athletics have won 63 games, and the Giants have won 57 contests. The City Series was the name of a series of baseball games played between the Athletics and the Philadelphia Phillies of the National League that ran from 1903 through 1955. After the A's move to Kansas City in 1955, the City Series rivalry came to an end. The teams have since faced each other in interleague play (since its introduction in 1997) but the rivalry has effectively died in the intervening years since the A's left Philadelphia. In 2014, when the A's faced the Phillies in inter-league play at the Oakland Coliseum, the Athletics didn't bother to mark the historical connection, going so far as to have a Connie Mack promotion the day before the series while the Texas Rangers were in Oakland. The first City Series was held in 1883 between the Phillies and the American Association Philadelphia Athletics. When the Athletics first joined the American League, the two teams played each other in a spring and fall series. No City Series was held in 1901 and 1902 due to legal warring between the National League and American League. The Athletics have retired six numbers, and honored one additional individual with the letter "A". Walter A. Haas, Jr., owner of the team from 1980 until his death in 1995, was honored by the retirement of the letter "A". Of the six players with retired numbers, five were retired for their play with the Athletics and one, 42, was universally retired by Major League Baseball when they honored the 50th anniversary of Jackie Robinson's breaking the color barrier. No A's player from the Philadelphia era has his number retired by the organization. Though Jackson and Hunter played small portions of their careers in Kansas City, no player that played the majority of his years in the Kansas City era has his number retired either. The A's have retired only the numbers of Hall of Fame members who played large portions of their careers in Oakland. The Athletics have all of the numbers of the Hall-of-Fame players from the Philadelphia Athletics displayed at their stadium, as well as all of the years that the Philadelphia Athletics won World Championships (1910, 1911, 1913, 1929, and 1930). 17 members of the Athletics organization have been honored with induction into the Bay Area Sports Hall of Fame. Also, from 1978 to 2003 (except 1983), the Philadelphia Phillies inducted one former Athletic (and one former Phillie) each year into the Philadelphia Baseball Wall of Fame at the then-existing Veterans Stadium. 25 Athletics have been honored. In March 2004, after Veterans Stadium was replaced by the new Citizens Bank Park, the Athletics' plaques were relocated to the Philadelphia Athletics Historical Society in Hatboro, Pennsylvania, and a single plaque listing all of the A's inductees was attached to a statue of Connie Mack that is located across the street from Citizens Bank Park. The records of the Athletics' last ten seasons in Major League Baseball are listed below. The Oakland Athletics farm system consists of seven minor league affiliates. As of the 2019 season, the Oakland Athletics have had 14 radio homes. Since 2019, the Athletics' flagship radio station has been KTRB 860 AM "The Answer". The Athletics also have a partnership with TuneIn which includes a free live 24/7 exclusive A’s station to stream the radio broadcast within the Athletics market and other A's programming. The announcing team features Ken Korach and Vince Cotroneo. Television coverage is exclusively on NBC Sports California. Some A's games air on an alternate feed of NBCS, called NBCS Plus, if the main channel shows a Sacramento Kings game at the same time. On TV, Glen Kuiper covers play-by-play, and Ray Fosse typically provides color commentary. Kuiper and Fosse are frequently joined by Dallas Braden, who adds additional color from the field level. The 2003 Michael Lewis book Moneyball chronicles the 2002 Oakland Athletics season, with a specific focus on Billy Beane's economic approach to managing the organization under significant financial constraints. Beginning in June 2003, the book remained on The New York Times Best Seller list for 18 consecutive weeks, peaking at number 2. In 2011, Columbia Pictures released a film adaptation based on Lewis' book, which featured Brad Pitt playing the role of Beane. On September 19, 2011, the U.S. premiere of Moneyball was held at the Paramount Theatre in Oakland, which featured a green carpet for attendees to walk, rather than the traditional red carpet. ^ "About Stomper". Athletics.com. MLB Advanced Media. Retrieved August 21, 2018. ^ Clair, Michael (March 17, 2017). "Why do the A's wear green? You can thank Charlie Finley". MLB.com. MLB Advanced Media. Retrieved January 6, 2018. Before Finley came on board, the then-Kansas City A's wore baseball's standard blue-and-red combination. In 1963, that all changed as Finley outfitted the team in glorious gold (Finley said it was the same shade the United States Naval Academy used) and kelly green for the very first time. ^ "Oakland Athletics Team History & Encyclopedia". Baseball Reference. Sports Reference. Retrieved March 26, 2019. ^ Boxscore from Baseball-Reference.com "Wednesday, April 17, 1968, 7:46PM, Oakland–Alameda County Coliseum"
^ "American Association (19th Century) - BR Bullpen". www.baseball-reference.com. Retrieved 2018-01-15. ^ "Logos and Mascots". MLB.com. Retrieved September 26, 2016. ^ "Mascots you don't see on sports sidelines". May 22, 2007. ^ "Stomper's Place". Oakland Athletics. ^ "Oakland A's to wear kelly green alternate jersey for Friday home games". MLB.com (Press release). MLB Advanced Media. January 26, 2018. Retrieved January 27, 2018. ^ United Press International (January 30, 1979). "Yankees, Twins still dickering". St. Petersburg Times. Retrieved June 19, 2009. ^ "Cashman Field | Las Vegas 51s Cashman Field". Web.minorleaguebaseball.com. Archived from the original on 2008-04-22. Retrieved 2013-08-18. ^ Leavitt, Parker (October 24, 2014). "Mesa's Hohokam Stadium ready for Oakland A's". The Arizona Republic. Retrieved 1 December 2014. ^ "A's settle on a ballpark site and a futuristic stadium". The Mercury News. 2018-11-28. Retrieved 2018-11-28. ^ Dennis, Rob (December 30, 2011). "Fremont mayor Bob Wasserman dead at 77". The Argus (Fremont). Retrieved January 21, 2012. ^ "A's, Cisco reach ballpark deal". USA Today. November 9, 2006. Retrieved May 20, 2010. ^ "Full text of A's letter to Fremont". February 24, 2009. ^ Associated Press (June 16, 2010). "Plans for A's stadium in San Jose moving forward". USA Today. San Jose, California. Retrieved May 5, 2018. ^ "How the A's ballpark plans stack up". San Jose Mercury News. Bay Area News Group. August 24, 2010. Retrieved August 18, 2013. ^ Seipel, Tracy (September 8, 2010). "75 Silicon Valley leaders endorse A's move to San Jose". San Jose Mercury News. Bay Area News Group. Retrieved August 18, 2013. ^ Calcaterra, Craig (Jun 30, 2011). "In case you forgot, the Athletics are still in franchise limbo". HardballTalk. NBC Sports. Retrieved August 18, 2013. ^ Koehn, Josh (July 12, 2011). "Selig Talks About A's Move to San Jose". San Jose Inside. Sanjoseinside.com. Retrieved August 18, 2013. ^ Associated Press (June 19, 2013). "San Jose sues MLB over A's vote". San Francisco, California: ESPN. Retrieved August 18, 2013. ^ Associated Press (January 15, 2015). "San Jose loses appeal over A's move". San Francisco, California: ESPN. Retrieved January 17, 2015. ^ Egelko, Bob (October 5, 2015). "U.S. Supreme Court rejects San Jose's bid to lure Oakland A's". SFGate. Hearst Communications, Inc. Retrieved August 19, 2015. ^ "Head-to-Head record for Oakland Athletics against the listed opponents from 1997 to 2018". baseball-reference.com. ^ Goldberg, Ron (March 24, 2018). "Athletics Offer $20 Parking Discount to Giants Fans Who Yell 'Go A's' at Gates". Bleacher Report. Retrieved March 26, 2018. ^ "2014 Promotional Schedule". Oakland Athletics. ^ Burgoyne, Tom (2004). Movin' on Up: Baseball and Phialdephia Then, Now, and Always. B B& A Publishers. p. 128. ISBN 0-9754419-3-0. ^ For photos of the A's Wall of Fame plaques, see Philadelphia A's Society Museum and Library Archived December 29, 2005, at the Wayback Machine webpage. Philadelphia Athletics Historical Society. Retrieved September 23, 2010. ^ Philadelphia Athletics Historical Society Archived September 27, 2010, at the Wayback Machine official website. Retrieved September 23, 2010. ^ Fitzpatrick, Frank (February 22, 2011). "Demographics may doom the Philadelphia Athletics Historical Society". philly.com. Philadelphia Media Network (The Philadelphia Inquirer). Archived from the original on February 26, 2011. Retrieved February 23, 2011. ^ For photos of the plaque, see Montella, Ernie (June 5, 2004). "Wall of Fame Day in Hatboro, Pennsylvania". Philadelphia Athletics Historical Society. Archived from the original on December 19, 2010. Retrieved September 23, 2010. ^ Jordan, David M. "Vet Plaques Come to Hatboro". Philadelphia Athletics Historical Society. Archived from the original on September 6, 2008. Retrieved September 23, 2010. ^ "Athletics Affiliates". Oakland Athletics. Major League Baseball. Retrieved September 11, 2014. ^ "Oakland A's confirm split with radio flagship via Twitter". The Mercury News. 2018-10-13. Retrieved 2018-10-29. ^ "A's announce new radio partnerships for upcoming season". The Mercury News. 2019-02-15. Retrieved 2019-02-17. ^ "The New York Times Best Seller List - June 22, 2003" (PDF). Hawes Publications. Retrieved April 23, 2014. ^ "Oakland shines for 'Moneyball' premiere". San Francisco Chronicle. Retrieved April 23, 2014. Lewis, Michael. Moneyball: The Art of Winning an Unfair Game. W. W. Norton & Co., Inc., New York, 2003. ISBN 0-393-05765-8. Slusser, Susan. 100 Things A's Fans Should Know & Do Before They Die. Triumph Books, Chicago, 2015. ISBN 978-1629370682.